Result: Karen Khachanov defeated Kei Nishikori by 6-2, 6-2. An eye catching performance was witnessed by Karen Khachanov as he cruised past the Japanese above just one hour. Karen playing at a fast pace opened the scoring, Kei made an effort but lost 6-2. The Russian, Karen again took the lead in the second set as Kei wasn’t able to score the opening points on his serve. At last, Kei Nishikori again faced defeat by 6-2 as he wasn’t able to score on a single ace in this set. Karen Khachanov will now face Roberto Bautista Agut in the Quarter-finals of the Halle Open 2018. Result: Roberto Bautista Agut defeated Robin Haase by 6-4, 7-5. The Spaniard, Roberto Bautista took a great start in the first set as he scored the opening point on an ace. 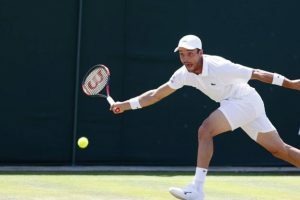 Roberto was extending his lead steadily, however, Robin Haase recovered the points after some time and the score was levelled 4-4. Eventually, the Spaniard sealed his win in the first set by 6-4 as Robin lost the last two points on his serve. In the second set, Roberto Bautista again took the lead and was extending it at a very fast pace. Robin Haase soon came back in action and started recovering the points. The score became equalized 5-5 after about 15 mins. Ultimately, Robin Haase again lost the last two points on his serve and didn’t make it to the next round. Despite the fact that, Robin Haase scored 10 points on aces, still he lost to Roberto Bautista in both the sets. Roberto Bautista Agut will now face Karen Khachanov in his next match of Halle Open 2018. Matwe and Marcin opened the scoring of the first set, however, they failed to extend the lead large enough for Max Mirnyi and Philipp Oswald. The score reached 5-5 after a tough fight between the two pairs. Finally, it was Max Mirnyi and Philipp Oswald who claimed the victory in the first set by 7-5. 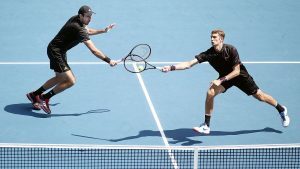 Both the pairs showed an outclass performance in the second set and the match eventually came to a tie-breaker as the score became levelled at 6-6. Max and Philipp won the set at last by 7-6(4) as Matwe Middelkoop and Marcin Matkowski both lost the last points their serves. Max Mirnyi and Philipp Oswald will now play against Marcelo Melo and Lukasz Kubot in the Quarter-finals of Halle Open 2018. Do join allsportspk to see the highlights of the 6th day of Halle Open 2018. Next articleBreaking World Cup 2018 – Uruguay Vs Saudi Arabia – 1st Half: Whose Leading?